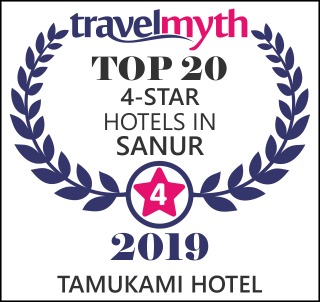 We have spent unforgettable 2½ weeks in Bali, Hotel Tamukami have played very important rate for our successful holiday and first trip to Bali. "Mama" and "Papa" have succeeded to create a real paradise for tourists with friendly atmosphere, lovely surroundings and exellent service. We have really enjoyed it from the first moment! 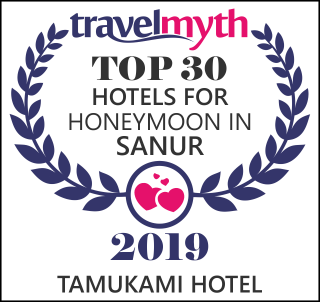 We wish a continual success to Tamukami, their owners Suzanne & Eugeen and the hotel staff. We can with pleasure recommeded it to our friends and acquintances in Finland. This was not our first trip to Bali but it was the most enjoyed. We would like to thank you for your welcome and your kindness. As we start a new year we'd like to wish to all of you all the best for 2002. Hope to come back soon. See you April 2002 ! It was very nice to stay at Tamukami. We had a great time in the sun by the pool, this place is like a paradise! We spent a very nice time at this hotel. We love all staffs of this hotel, of course, the owner and wife too. This is our first trip to Bali. A heartfelt thanks to all the staff in Tamukami. You have provided a very warm, helpful, friendly service. Thumbs up to you guys/girls !!! .this is a first - class service hotel in Bali. Because of you folks, we have a rewarding and marvelous experience in this wonderful island. Should we have friends who are interested to visit Bali, we would strongly recommend them to stay in this cosy hotel. I'm completely impressed by the friendliness & kindness of the staff. Here at the Tamukami. I'm traveling alone, yet I feel at home here. Thank you for making my first trip to Bali a memorable one & hope to visit again. If you are ever in New York look me up. It would be my pleasure I show you how Grand NYC is. Thank you for making my trip so comfortable with excellent service, high standard of cleanliness and a beautiful surrounding ! Une étape agrèable à Bali dans un hôtel de charme, où le personnel et d'une grande gentilesse. At the Tamukami we feel like at home. Thanks at all the staff. Thank you for everything. Smiling faces, Happiness people, all people in Bali thank you for everything. Hello everybody from TURKEY - ISTANBUL. het is geenziens overdreven. We genoten elke minuut van ons veel te kort verblijf in Bali en het Tamukami Hotel. Een prachtig hotel, verrukkelijk eten en ongelooflijk vriendelijk personeel maakten ons verblijf onvergetelijk. Als we terug maar Bali komen, komen we zeker langs. Thank you for being here, a waterhole and a place for relaxing. Superb rooms, superb service, excellent food. All in all. A Paradise. Tamukami is voor ons, onze Balinese thuishaven geworden. We zijn altijd blij de vertrouwde gezichten terug te zien. Ook deze keer was het een mooi begin en een mooie afsluiter voor onze Balireis. Bedankt aan iedereen voor de altijd hartelijke ontvangst en de prima service.Tot de volgende reis. Het was ons zeer aangenaam hier te mogen vertoeven ! Alles was Pico-bello geregeld-kamer & badkamer is een pluim! Het eten was echt verzorgd & lekker-Vriendelijk &voorkomend personeel and the big Chief " niet te vergeten ! U mag er op rekenen dat wij in Lebbeke en omstreken je Hotel & Restaurant zullen aanbevelen. Thank you Tamukami for making my stay very good.I could not fault anything. Despite a difficult trip from Java and a 'testy' family, no problem, was too difficult to tackle for the staff - thank you !. We loved the room and the light in it ; the pool and garden was lovely. For our last night in Bali -after a year on the island. There was no better send off than drinks with friends and dinner in the restaurant with the songs of Indonesia. Thank you to the staff at the Tamukami - we'll be back again. Wat een mooi eiland, geweldig Hotel fijne mensen, lachen altijd. Eten is heerlijk. Probeer volgend jaar mijn man mee te nemen. The most nice people & the most beautiful place we saw since we are in Bali. See you maybe a next. Superbe, Quoi demander de plus Luxe, Charme Tout, tout quoi. Merci pour vos bons soins. Nous sommes ravis de notre court sejour au Tamukami A L'an prochain? Your staff was very good, rooms well taken care of and the pool was perfect. I definitely enjoyed my stay and will be back next time. Die beiden Von Rodelheim haben ihren Aufenthalt genossen, was durch die gemutlichkeit und zauberhafte Aufnerksamkeit des Personals und Managements nicht schwer fiel. Herzlichen Dank und wir kommen gern wieder. After a not so good start at our visit in Bali, we decided to find a place with some luxuary. And so we did! 6 wonderful days at Tamukami and the lovely pool has made us full of energy to continue our trip arround the world.
" Boss "nicht angetroffen aber Ihre arbeiten waren schr gut auf Ihren Platzen. Ursula Vink ( ons osterreich ) lebend in Holland und Kees Vink, Netherland. Beautiful garden, nice pool, good atmosphere pretty town, great wave, and very kind hotel staff. I don't need anything other !!! We've had a great time here. You were recommended by Dive and Dive staff and owner. Thanks to all the staff !!! I will be back with my family next time !! We were looking for a few day relaxation and certainly found it here, with a lovely room and pool area, friendly staff tranquil surroundings. Loved my stay here. The pool is one of the best in Bali. The staff here is exceptional always willing to help & always smiling. I would definitely send all my friend here to stay. Looking forward to my next trip to Sanur a staying here in Rm # 202. This is our second stay in Tamukami Hotel. Once again we found the hotel and staff exceptional. On our next visit to Bali we will definitely stay in your hotel again. We will also highly recommend your hotel to family & friends. Warm regards and thank you again to all staff. Thank you for wonderful days !!. Wij hebben genoten van Tamukami, prachtige tuin en zwembad, en prima de luxe kamers. Om hier ook in je eigen taal te kunnen praten, is ook een pluspunt. Lieve mensen het gaat jullie verder goed. Met dank, John & Christine. Everything was excellent : service at Front Desk, Housekeeping, Massage, Food at Alise's Restaurant, etc. Also beautiful, serene setting + layout for the entire Hotel. We look forward to returning ! We've had a truly relaxing time in Bali, and the Tamukami is perfect for that. The most beautiful pool and surroundings. P.S: Love the noisy pet birds !. Ein kurzer, sehr angenehmer zwischen stopp auf dem weg nach Lombok. Live musik. Wir sind begeistert ! Thanks so much for making our stay here so memorable. Thank you especially for all the little extra's every day that made the 2nd half of our holiday a delight, and for making my birthday so special. If we are ever in Bali again, we will definitely be here - will also recommend Tamukami to all our friends in Aussie Land . By the way, we loved the dinner, breakfast and entertainment.